The foreign secretary said penalising "escape" was "not in the interests of our friends and our partners". PM Theresa May set out her Brexit strategy, including leaving the EU single market, in a speech on Tuesday. At Prime Minister's Questions, Mrs May clashed with Labour leader Jeremy Corbyn, telling him she had a "plan" and he did not "have a clue". Mr Corbyn accused her of "threatening to turn Britain into an offshore tax haven". 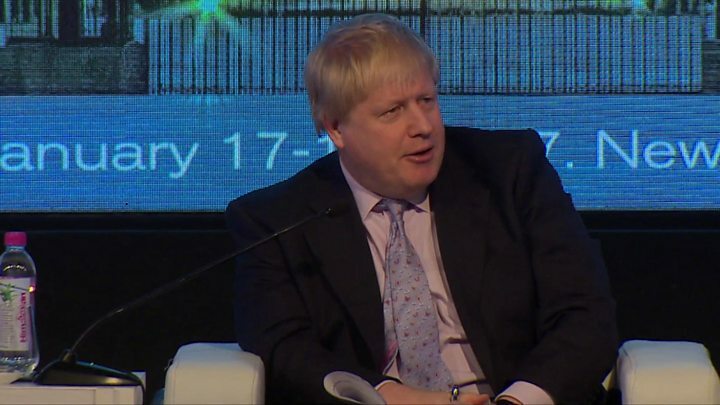 With just over two months to go before the UK government is due to get Brexit talks under way, Mr Johnson was asked on a trip to India about comments by an aide to French President Francois Hollande, who said the UK should not expect a better trading relationship with the EU after leaving it. He replied: "If Monsieur Hollande wants to administer punishment beatings to anybody who chooses to escape, rather in the manner of some World War Two movie, then I don't think that is the way forward. "I think, actually, it's not in the interests of our friends and our partners." Downing Street later said Mr Johnson "was not in any way suggesting anyone was a Nazi". Former cabinet minister and Brexit campaigner Michael Gove hit back, tweeting that people offended by Mr Johnson's "witty metaphor" were "humourless, deliberately obtuse, snowflakes". EU leaders have begun to deliver their verdicts on Mrs May's speech, in which she also warned against trying to "punish" the UK for Brexit and hinted she could walk away from talks if not happy, stating that "no deal for Britain is better than a bad deal for Britain". German Chancellor Angela Merkel said: "The be-all and end-all is that Europe does not let itself be divided, and we will ensure that with very intensive contacts.'' EU governments would consult their business sectors, she added, and she was "not worried that we will not stick together". Mr Juncker said he would work to ensure Brexit talks are carried out "according to the rules and they yield good results". He added: "I welcome the clarifications given by Mrs May, but I said to her last night that a speech will not launch the negotiations." Not surprisingly, uproar has ensued. Former Labour leader Ed Miliband said Boris Johnson had shown once again that he could be "supremely clever and yet immensely stupid". "But you cannot at the same time then say, 'Oh, and that little piece that interests me, and that is something that I like.' No way." However, European Council President Donald Tusk was more conciliatory, tweeting: "We took note of Prime Minister May's warm, balanced words on European integration. Much closer to narrative of Churchill than President-elect Trump." Downing Street said European leaders spoken to by Mrs May in a series of phone calls had welcomed the "clarity" of her plans. In its headline, the Times sums up the prime minister's message to the EU as "Give us a fair deal or you'll be crushed". Meanwhile, the Brexit-supporting Daily Mail draws parallels with Margaret Thatcher, saying Mrs May exhibited the "steel of the new Iron Lady". The Guardian, which opposed Brexit in the referendum, found the speech a "doubly depressing event" - a reality check for those who want to keep the UK in the single market while being riddled with its own streak of "global fantasy". The Financial Times praises the prime minister's "bold vision" but warns that the road ahead will be perilous. The Sun's front page is mocked up as a Biblical tablet of stone bearing the single-word headline "Brexodus". In her speech, the prime minister suggested the UK could cut its corporate tax rates to compete with the EU if denied access to the single market. And she promised that Parliament would get to vote on the final Brexit deal. Asked what would happen if MPs and peers rejected it, Brexit Secretary David Davis told Today: "They won't vote it down. This negotiation will succeed. It will succeed." The government says it will invoke Article 50 of the Lisbon Treaty, getting formal Brexit talks with the EU under way, by the end of March, with discussions set to last up to two years after that. A "catalogue of demands with some threats thrown in" is German news magazine Der Spiegel's description of Theresa May's Brexit speech. It says that her desire to leave the single market while retaining access to trade with Europe shows that her government is "not just nasty but also blind to reality". Germany's Die Welt also mocks her with the headline "Little Britain" and accuses her of leading the country into "isolation". In Italy, La Repubblica's front page reads "Brexit: London raises its wall 'away from the EU and the single market'". France's Liberation remarks that Mrs May's comment that no deal is better than a bad one suggests that she is threatening to turn Britain into a tax haven. "If this is not blackmail, it looks a lot like it," it says. At Prime Minister's Questions, Mr Corbyn urged Mrs May to "stop her threat of a bargain basement Brexit, a low-paid tax haven on the shores of Europe". He added: "It won't necessarily damage the EU but it would certainly damage this country." Mrs May told MPs: "What I set out yesterday was a plan for a global Britain, bringing prosperity to this country and jobs to people and spreading economic growth across this country." UKIP leader Paul Nuttall said: "It's clear that Britain is going global, as a result of that momentous [EU referendum] vote on 23 June." Analysis: Clearest idea of deal?